In the last decade I have changed one too many phone covers and laptop skins. The amount of time I spend with both those things justifies the action (in my opinion). However, I had never customized their of the two, until CaseApp got in touch with me and asked me to share my thoughts about their service. Needless to say, I was more than happy to oblige. CaseApp is an online store where you can create a custom case or skin for your phone or laptop. They have several designs you can choose from or you can create your own from scratch or by editing their templates. For the iPhone, they offer a tough case that comes with an outer hard case and a silicon inner lining. They offer two kinds of finishes, glossy and matte. The app interface is user friendly with the option to upload an image, create a collage, insert text, add a background and add clipart. The other product that I had ordered was the laptop skins. It is an adhesive sticker that protects against scratches and can be applied to laptops as well as, iPhones and iPads. 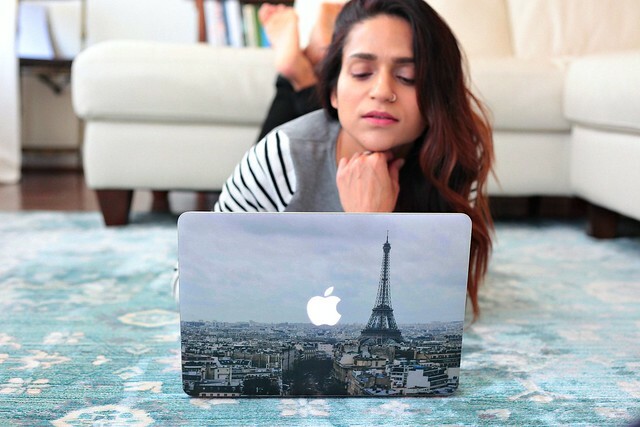 While I liked their original design, as it was clean and minimalist for the phone, and a stunning view of Paris for the laptop skin, I do appreciate the option to customize. In the future I would like to create a one which is in my blog colors. You are able to change the background color and added text to the bottom of the case. My only concern would be that the iPhone case does not cover all sides of the phone. In case you drop it on the upper right corner, where the phone is not protected by the case, it will definitely leave a mark. However, I found the user interface and the ordering process quite easy and efficient. There are a lot of options to choose from and the templates itself are quite nice should you not wish to customize. Now, here's there good stuff, CaseApp would like to gift one of my readers with free case ($40 value). The entry is quite easy. Follow "tanviidotcom' and CaseApp on Instagram to win. Comment below with your Instagram username to let us know you followed. Good luck! Ends November 10th. Updated: Winner of the giveaway is Kim Pincombe Cole. Congratulations! 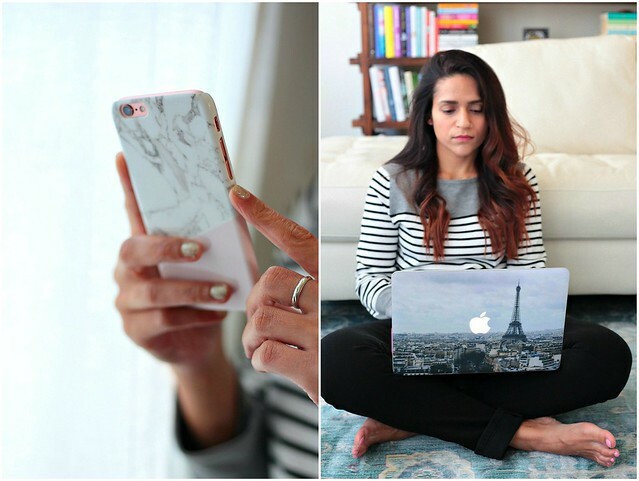 Also, here’s a 20% discount code for you to use, "TANVII20"
I love the cases!! My favorite was the laptop one �� i love Paris! Love the Paris laptop skin! I am in in in :) Have been following Tanvii for a long time and now Caseapp too.. My user name is "thedancinglawyer"
Followed! @zahra_sandberg - crossing my fingers!